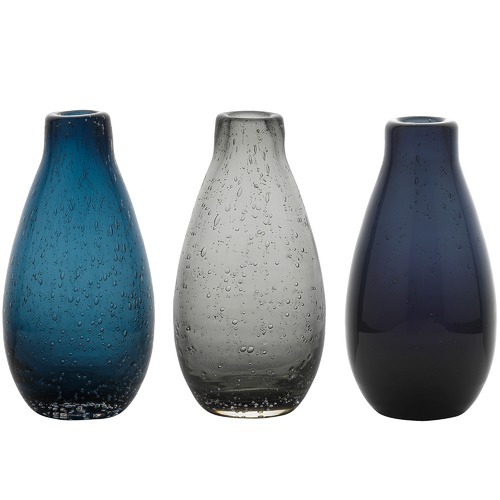 When you buy a 3 Piece Halo Droplet Mood Vase Set online from Temple & Webster in Australia, we make it as easy as possible for you to find out when your product will be delivered to your home in Melbourne, Sydney or any major city. You can check on a delivery estimate for the Ecology Part #: EC18111 here. If you have any questions about your purchase or any other Vases product for sale our customer service representatives are available to help.Whether you just want to buy a 3 Piece Halo Droplet Mood Vase Set or shop for your entire home, Temple & Webster has a zillion things home. These are high quality and look lovely on a north facing window sill with a few flowers in each and the light shining through them. They are quite little, so take note of the description. Glass quality is great and they are super cute however soo much smaller than I was expecting. I didn't read the dimensions and just assumed they would be "regular size" vases. They are cute and nice thick glass though. Will still use them.